I’ve known the madman behind Slashermania for years. Our shared love of horror has forged a bond of friendship that crosses Oceans from England to Texas. Russell Hillman loves slasher movies. He loves them in this wonderfully gonzo and bizarrely innocent way. If a love for violent pulp cinema can be considered pure, Russ is as pure of heart as they come. That is why it came of no surprise when he decided to fuse his deep passion for comics with his love of slasher flicks. 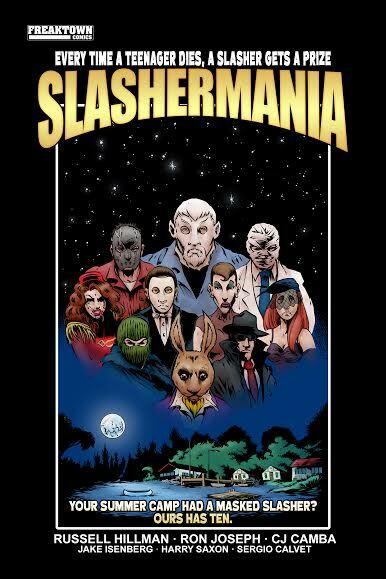 Welcome to Slashermania, a graphic novel I can only describe as “The Hunger Games meets Cabin in the Woods.” Slashers rise, teens die, and awards are given out! I want you to get to know Russell Hillman as well. So, let the games begin! Tell us about yourself, your career, and how you came to create Slashermania? I’m a shaven-headed 40-year-old short-and-portly nerd guy from England. I’ve been working in comics in my spare time for 13 years – much of that as editor for a title called Halloween Man. But I started out with my own comedy book, a flat-share sitcom comic called It’s the Beer Talking. A few people read it, and I think it even got a review. A few years back I launched my own self-publishing imprint, Freaktown Comics. I’ve published three books so far, Slashermania will be the fourth although it was written before some of the others. Slashermania’s origins are long and complex. It started with a plan to write a fake biography of a Corman-esque producer of b-movies and exploitation flicks, inspired by my love of retro trailer collections like Grindhouse Trailer Classics and 42nd Street Forever. I had a long list of film titles and very vague concepts for what they were about – Euro werewolf movie Bloodlust of the Wolfbeast, women’s revenge flick Lady Sniper, drug/biker movie Love’s Sweet Destruction, things like that. Slashermania was literally the last one on the list. Then while I was researching exploitation movies, I heard about a book called Shock Festival by Stephen Romano, which covers a lot of the same ground. Too much of the same ground for me to continue. So, I had a list of concepts and no idea what to do with them. A few years later, some random ideas coalesced into a solid concept. I was thinking about the serial killer convention issue of Neil Gaiman’s Sandman, and wishing they’d had an awards ceremony like the Eisners or the Harveys in comics, or the Oscars. I got to thinking about what the awards would be for, and the idea of coupling it with an Olympic-style event appeared. From there, it just built until I had enough to start writing. Having read the script, I know there is a strong vein of late 70’s slasher films in this project. Most slasher related stuff tends to skew more towards the mid to late 80’s boom of horror. But you seem to stop your frame of reference around the time of Friday the 13th part 2. Is there a reason you strayed away from referencing things like Child’s Play or Hellraiser? 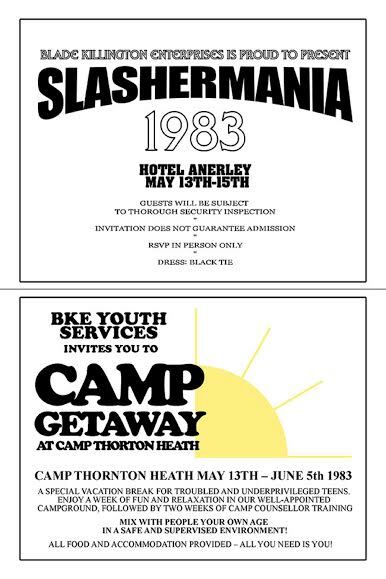 Slashermania is inspired by the first wave of slashers, from Halloween in ‘78 through to things like Sleepaway Camp in ’83 and Girls’ Nite Out in ’84. It had started to fade around then – Michael Myers had already made his first final appearance in Halloween II, and Jason was about to bow out for good in the fourth in his series of twelve movies so far. Then along came a guy in a striped sweater and started up the second cycle. The slashers in Slashermania are supposed to have been around for a few years at this point, and so would have been in movies that came out around ‘78-‘82. At that time, slashers were mostly just masked killers – Freddy really drove the supernatural side to the fore, though he wasn’t the first by any stretch of the imagination – and the not-explicitly supernatural slashers are my preference. Along that same frame of mind, here is a multi-part question, favorite slasher movies by era? 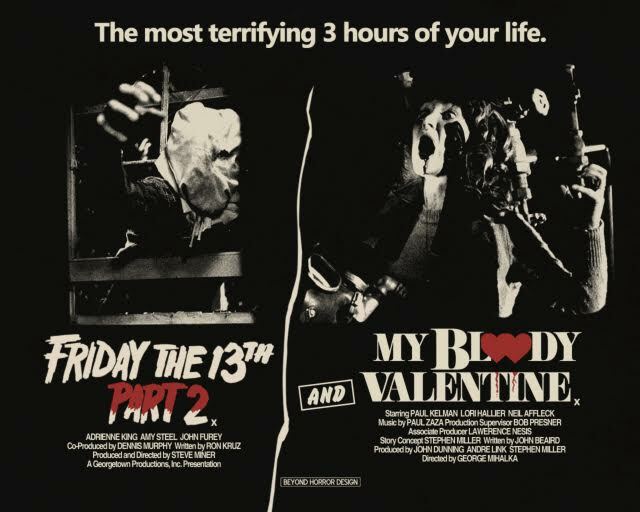 70s/early 80s – My Bloody Valentine, Friday the 13th Part 2, Black Christmas, Halloween, The Burning. Mid ‘80s/Early ‘90’s – Friday the 13th: The Final Chapter, A Nightmare on Elm Street 3: Dream Warriors, Jason Lives: Friday the 13th Part 6, Sleepaway Camp 2: Unhappy Campers and the terrible-but-I-love-it Slaughter High. Mid ‘90s-early ‘00s – Urban Legend, Scream, Scream 2, Freddy vs Jason, Bride of Chucky. Mid ‘00s- present – Hatchet II, Behind the Mask: The Rise of Leslie Vernon, Friday the 13th, The Final Girls and My Super Psycho Sweet Sixteen. And about a dozen or so from each era that could have come in sixth place. How did you form your art team and tell us about them in detail? The art team came about in the usual way for indie books – hunt around online for anyone with the right style/price/interest until you find them. I found original artist Ron Joseph and colourist Harry Saxon on deviantArt. After my first, unsuccessful Kickstarter campaign, Ron was starting to get work at IDW and I lost him. When I was ready to get the book started again, I put out the call on Twitter and CJ Camba responded. I have nothing but good things to say about any of them, they’re all art gods and they make my silly ideas look like gold. The designs of the various killers and monsters are amazing! How involved in the design process were you? Thanks. I had a description for each one, including the ones with single-panel appearances in the prologue, and Ron worked his magic. Some were perfect straight away like Franklin Frost, others took a bit of tweaking and came out so much better than the original idea, like The Mechanic. You’ve just launched a Kickstarter, tell us about your goals? I’ve gone quite straightforward with this one, trimmed away all the fat. There’s digital and print versions of the book, a script/pencils collection for those who want to peek behind the curtain, some of my other books in digital or physical formats, and a set of art cards based on the pin-up gallery – 12 posters of the “earlier films” for all of my slashers. If this project is successful, will you expand on this universe? If so, any teases on where you’d go next? If I’m lucky enough to go way over target on this, it’ll be funnelled into my next book, a straightforward single-slasher high school story tentatively called Shelter from the Storm. After that, I’ve got Slasher’s Dozen, AKA Before Slashermania – 13 tales of various slashers, some from Slashermania, some from the prologue and some making their debut. Each story takes place in a different month, from February ’82 through to February’83, and is 13 pages long. Assuming that the money keeps rolling in from them, I’m working on turning it into an ongoing. I’ve got over 40 different slashers ready to go out and kill! If you were in a slasher movie, do you think you’d survive? I’d probably be a secondary character, like someone’s angry and strangely secretive and overprotective dad, keeping their daughter home when she wants to go out “tonight of all nights”, or a night watchman at the site of the abandoned hotel where those murders happened ten years ago this very night – I’d get a couple of scenes at most and then get my throat slashed at about the halfway point. Probably not even a stand-out scene, just bumping up the bodycount by one. Or I’d be the one in the mask. Heh-heh-heh-heh. 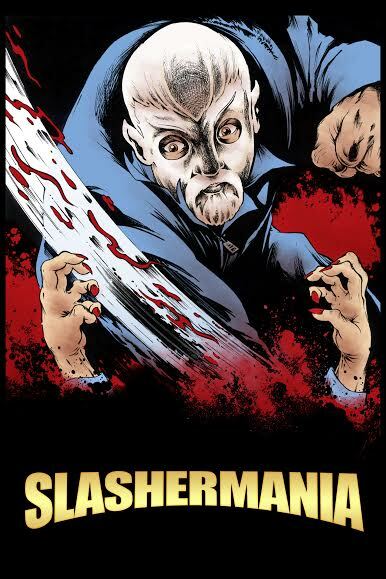 Who is your favorite slasher you’ve created for Slashermania? © 1986 Paramount Pictures − All right reserved. 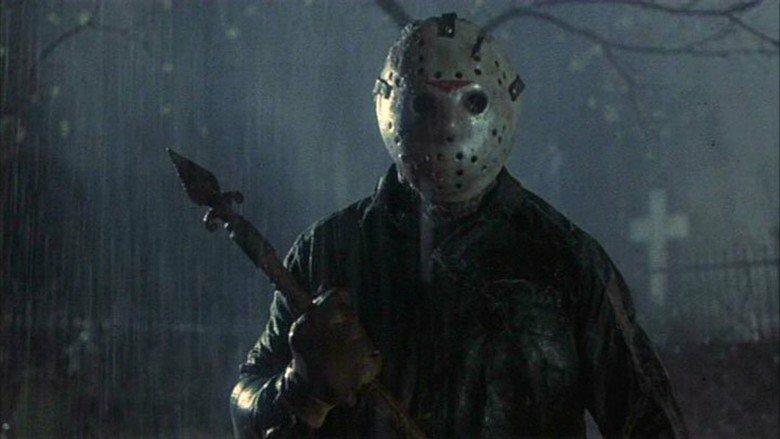 Friday the 13th 2009 isn’t a remake, it’s the same Jason at the same Crystal Lake. If you’re looking for solid continuity with no contradictions or slip-ups, you’re watching the wrong series. Urban Legend is a vastly underrated film. I would kill to write a true third sequel in comic book form. 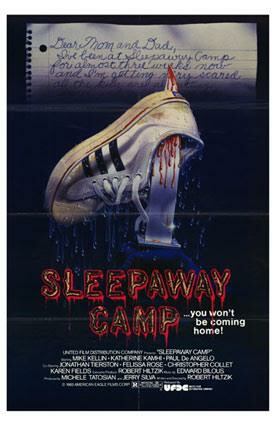 The final scene of Sleepaway Camp is the start of the third act, not an ending. The best part of Phantom of the Mall: Eric’s Revenge is the theme tune, Is There a Phantom in the Mall by The Vandals. It’s better than Dokken’s Dream Warriors. If this rambling nonsense interview appeals to you, if you enjoy comic books like Hack/Slash and Nailbiter and films like Behind the Mask: The Rise of Leslie Vernon and Cabin in the Woods or if you just want to see a man in a realistic hare mask murder two horny teens while talking about his ice cream preferences, please support Slashermania on Kickstarter. We’re doing well, but now you’ve heard what I want to do next, don’t you want to give me all your money? Of course you do! You want to know about the hockey axe and see what I do with the urban legend of The Hookman, right?